Formal school dance events like prom and homecoming don’t exist in China, but that hasn’t stopped hundreds of young women from renting luxury gowns without an occasion to wear one. These women don’t need a reason for donning Vera Wang and Valentino—just a selfie stick and a social media following. This describes a significant portion of the twenty-something females that have joined in on the luxury rental craze not by going to a high-end restaurant or ritzy club, but by taking pictures on the street or in a park. Luxury brand dress rental services like U.S.-based Rent the Runway and Bag Borrow or Steal have been catching on among fashion-savvy and status-hungry consumers in first-tier cities, and they’ve also been steadily spreading to aspirational consumers in smaller locales. Xu Baizi, founder of Shanghai-based evening gown rental site Ms. Paris that launched last year, said this also includes a segment of her own clients. It’s not only the value of choice that affects these clients. Those who rent luxury gowns in the big cities have a more developed scene of high-end restaurants, clubs, and bars where they can go on dates, company dinners, or parties. Xu said some of her customers in smaller, less developed cities, may not have access to this scene or even some of the culture surrounding formal wear, but still rent dresses to try out styles and take part in the lifestyle. Most of her clients are under 24 and a large portion of them are in college. “Girls who are in their early 20s have grown up with U.S. TV shows where all the high school kids go to prom,” she said. “They really want to be like that, but there is no easy way for them to participate.” Their solution? They rent party dresses and gowns for going to the mall, drinking at cafes, taking artistic street-style shots to show off to friends online. One subscriber from Tianjin posts photos of herself on the Ms Paris app in her home and with a Starbucks. 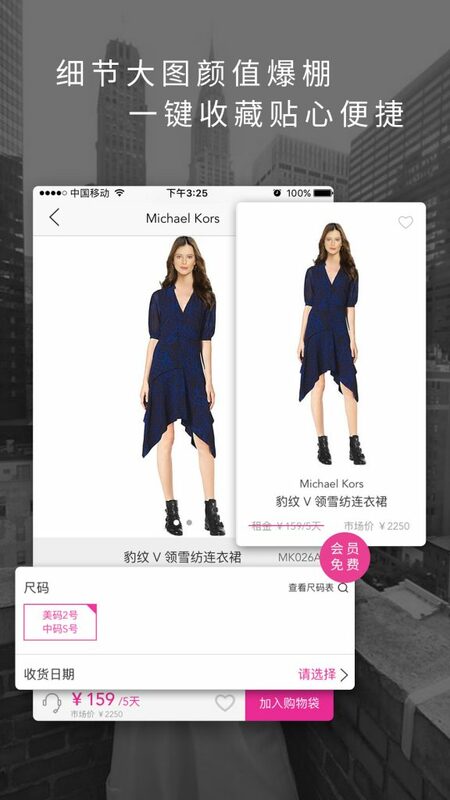 These social media-obsessed have access to a system at Ms Paris that lets them rent an unlimited number of garments a month starting at 518 RMB, where at any given time, they can rent items that add up to 400 RMB. Daily wear starts at 100 RMB, meaning members can borrow as many as four items at a time. Members get access to special events and experiences, like parties on a VIP yacht, rides in luxury cars, and dinners, and the photos they take from the events get uploaded into Ms Paris’s social media app on WeChat. Xu said they’re also capitalizing on another trend that’s catching on in China: the company-wide high-end gala. To capture this market, Ms. Paris has worked with firms such as Citibank, HSBC, and Morgan Stanley to give employee-wide discounts for dress rentals for their company galas. Of course, these women could simply be buying a non-designer dress to own on Taobao for the about the same price as a rental. But Xu said her clients are now sophisticated enough to know the difference in quality between mass-market and designer brands and prefer to get a higher quality item—they can get a Vera Wang gown for as little as 340 RMB a day. Xu said she plans to take Ms Paris a step further to stand out from local competition and make it truly a social experience by building a recommendation system based on a user’s behavior. Currently, Ms Paris features about 3,000 dresses selected from high-end department stores in the United States, and brands range from popular names like Vera Wang and Chanel to more niche brands like Alice + Olivia and Lipsy. Next year, they plan to roll out handbag and accessories. The consumers aren’t the only ones benefiting from the accessibility of rental services. International brands that have less exposure in the market can be on a platform side by side with big-name players, thus giving Chinese consumers a reason to trust them. Rental services also give these brands the marketing potential to not only build brand awareness among aspiring young Chinese consumers using social media, but to discover exactly what China’s subscribers want. For example, while more conservative shades like blue and black are typically popular evening gown colors in the United States, Xu has found that bright and hot pink evening dresses are popular with Chinese clients. Some even pick out what U.S. women would typically wear as a bridesmaid dress for dates.